OFTEN carers are unintentionally overlooked by friends and family, the focus being on the person being cared for. If a carer seems to be coping well they are usually held to be strong, magical, super-human beings, but this isn’t always the case. Most carers juggle work, family and finances and stress levels that may be hidden for everyone else’s sake. The author writes that one day she visited her doctor because she was sleep deprived and crying uncontrollably – finally someone recognised the emotional pain and turmoil I was in and the impact this stress was having on me. Navigating Alzheimer’s is an insightful account of Carolyn Cranwell’s 18 years of caring for her husband who was diagnosed with Alzheimer’s in his early 50s. Her experience, however fraught, has cumulated into a significant, sensitive and helpful book for those who may feel overwhelmed with their role as carer. There are many survival tips that provide not only down to earth practical advice but also encouragement and inspiration. Each day had its own hurdle to be surmounted, each week another curved ball, and each year more courage and resilience was needed and found by this remarkable woman. Navigating Alzheimer’s is an absolute must for carers and their families. 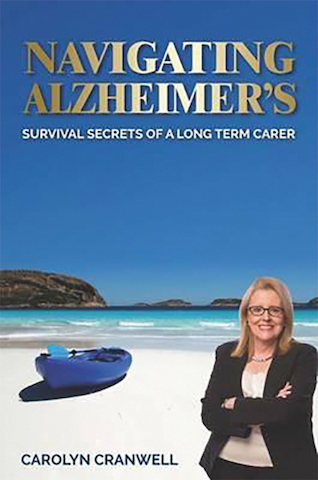 It is available online at navigating-alzheimers.com/shop/ and online retailers Angus & Robertson and Booktopia. to Navigating Alzheimer’s, Have a Go News, PO Box 1042, West Leederville WA 6901.